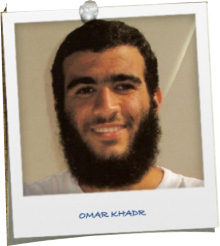 Today, Omar turns 27. On 23rd Sept, it is his first court hearing since the sham trial in Guantanamo. Dennis Edney, Omar’s lawyer, is arguing in court that as Omar was a ‘young offender’ when incarcerated, he should not be in maximum security prison in Canada right now but provincial prison instead (this way, Omar will be eligible for parole). We need to give Dennis as much support as possible — needless to say, Omar needs our support desperately — and so we are doing a TWITTERSTORM today. We need a few minutes of your time to participate in this, please. Spread the word. Thank you.